What a month it has been! My baby girl clocks 4 weeks today, and she's starting to look so big to me. Her first couple weeks were spent sleeping, eating, and sleeping some more. Her limbs flailed, her eyes wandered, and though she was adorable, she hardly seemed like a real human being; she was a fragile little creature whose life had been handed to me to guard and nurture. 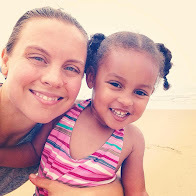 Loving her, caring for her, came naturally to me, but I was still overwhelmed at times. The sleep deprivation took a major toll during those first two weeks. I felt guilty for not enjoying her more, for thinking at least once a day that I can't wait for her to grow up and become a little more independent. Be careful what you wish for! Babies change so much, so fast, that it doesn't make sense to despair. Just when you think you can't go on another day with the current situation, it will change, and leave you scrambling for answers. 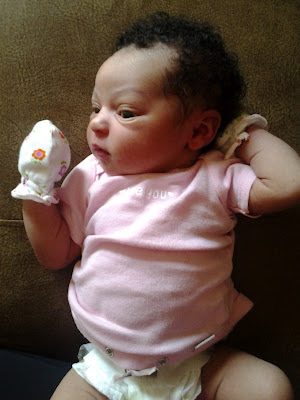 Amaliya really woke up during her third week of life. She's alert and looking around all day, she screams to let us know that she doesn't like how we're holding her, she's starting to talk to herself and make sounds that are unrelated to feedings, changings and sleepiness. (And gas. Oh, the gas). Speaking of sleep, she excels at it, and we get a 4-6 hour stretch followed by a 2-3 hour stretch every night. For this, I am eternally grateful. As her personality develops, and I see her becoming more and more her own person every day, it's easier for me to appreciate the little moments with her. We have a great time in the mornings when her daddy goes to work, I toss her up on my shoulder and we dance around for an hour or so, then she'll roll around on the floor while I stretch and do my ab work. She spends her afternoons nursing and napping on my chest, or spending quality time in dad's arms while I make dinner. Her eyes get heavy at 8pm every night; I swaddle her, feed her, rock her to sleep in her bedroom, and put her down in her crib for the night. It's a demanding, but blissful, routine. I'm doing my best to stay in the moment and enjoy every snuggle. They really do grow up fast. Amaliya likes: dancing around the house to my running playlist, sucking on her fists (and anything else that comes close to her mouth), being talked to, laying on the floor and staring at the blinds, warm baths, nursing, being swaddled, falling asleep on mom. She dislikes: dirty diapers, people ignoring her, napping, tummy time, the Moby wrap. How's mom doing? : I'm really good! My pain pretty much went away the first week and was never very bad (I only needed to pop a couple Tylenol on the first day, otherwise never needed a pain killer), and my stitches are dissolving slowly but surely. As far as exercise goes, I jumped back in as soon as I could. I was walking miles at a time the first week (slowly), went for my first run at 12 days postpartum, was back to Body Pump at 3 weeks, and rejoined the Lopers club to begin half-marathon training today! Still - and this is just me being ridiculous, I know - I'm frustrated. The two mile run I took today was HARD, my body feels soft, I'm up 12lbs from my starting weight, and I'm in a big fat hurry to get back to the fitness level I achieved before getting pregnant. Wah. BUT, as my husband keeps telling me, "You just had a baby! The fact that you're doing anything is an achievement!" Point taken. I'll stop complaining now. And dad? He's in love. I tell you, it's not easy to balance a marriage and a baby. You really do go into survival mode for a while, your entire life revolves around taking care of a little person and sneaking in sleep whenever possible. I was worried going into this about how I would balance my love and attention between my daughter and my husband, but it hasn't been so difficult. We may not have much alone time, long walks together are temporarily on hold, the bed exists strictly to facilitate sleeping... and yet it's okay. He wakes up with me at 3am just to fill my water bottle while I'm breastfeeding. He keeps the bathrooms scrubbed so I don't have to touch the cleaning chemicals. He takes care of the fussy baby after a long day of work so I can fit a run in. These days we show our love more through little, considerate acts, and through a mutual adoration of the life we brought into being. This man. This MAN. I don't know where I'd be without him. 4 weeks and surging forward, growing every day. Slow down a little bit, would you? She has really grown! That girl, what a cutie pie! Yes, marriage for us has changed, but for the better. It's a million times better. You both get a new love & respect for one another, bringing this life into the world really changes your perspective on that better half. 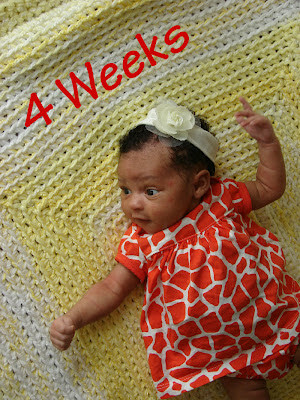 Happy four weeks... (er, is it 5 now, though?? oops!)!! !